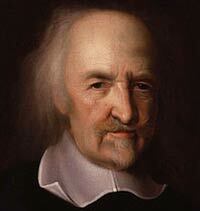 Thomas Hobbes (1588-1679) was a philosopher from England who is best known for his political philosophy works. Much of Hobbes’ philosophy centered on ideals like the natural equality of men, the right of an individual, the artificial character of political orders, and a liberal interpretation of the law which leaves human beings free will to do what the law does not forbid explicitly. Hobbes was born in 1588 in Westport, England. He went to school at the Westport Church and the University of Oxford from where he graduated. Thomas followed his own curriculum when he was at the university and was recommended by Sir James as a tutor for the son of William Cavendish. Hobbes was exposed to European critical and scientific methods. His scholarly efforts were aimed at careful studies of classic Latin and Greek authors. The outcome of this was his great translation of the Thucydides History of the Peloponnesian War. It was his first translation from a Greek manuscript into English. He continued tutoring as he expanded his knowledge in philosophy which awakened his curiosity over several key philosophical debates. The first area of study for Hobbes was in the physical momentum and physical doctrine of motion. His first scheme was to work on a systematic doctrine that would show how physical phenomena are universally explicable in motion. In his research, he singled out man from nature and plants. In another treatise, Thomas showed the specific body motions that were involved in the output of peculiar phenomena of knowledge, affections, sensations and passions where man came into relation with man. He finally considered how men moved to enter into the society in his final treatise. He proposed bringing together the phenomena of state, body, and man. Hobbes also extended his work to the third section of his publications by the name De Cive, which was completed in 1641. It was received well and it included lines of arguments which were repeated a decade later. He returned to work on the first sections of his previous works and published Tractatus Opticus which contained scientific tracts. In 1642, Thomas became a mathematical instructor to a young Prince of Wales named Charles. In 1658, he published his final section of the philosophical system, completing his scheme that he had planned for over 20 years. Hobbes is credited with being the founder of the modern political philosophy. Hobbes’ understanding of people as being motion and matter and obeying similar physical laws as other motion and matter still remains influential. His account on human nature as cooperation that is self interested and of the political communities as being based on a social contract remains a major topic in political philosophy. Hobbes died in 1679 after suffering a bladder disorder. He is interred in the St. John Baptist Church in England.